"Calling all snow seekers.” Recent storms have left the local mountains covered in new snow and Mountain High’s North Pole Tubing Park is now open for the holidays. Up to six lanes are available accessed by two moving carpets. Nothing is better than enjoying family around a warm fireplace on a snowy winter day. 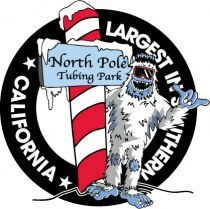 And the North Pole Tubing Park is where Southern California does just that. Located an hour and a half from downtown Los Angeles, the snow is easy to find at Mountain High and there is never any mountain driving. The tubing park is open from 9:00am to 4:30pm seven days-a-week through January 4th, then Saturdays, Sundays, and holidays peak season. (Weather permitting). Prices for everyone over three and a half feet tall are $20 for two hours of unlimited rides and $35 for a full-day. Tickets for children 36 to 42 inches tall are $15 with a paying adult. Tubes are included in the ticket price, and children 36 to 42 inches tall must accompany a parent in a separate tube. Children under 36-inches tall are not permitted for safety reasons. First-time tubers will want to know that while temperatures in the mountains average 20 to 30 degrees colder than the city, staying warm is easy. The best choice is water-resistant, layered clothing that can be added or removed as the weather changes. It is always best to be prepared as conditions can and sometimes do change rapidly at high elevations. If clothes are not water resistant, a water repellent spray can be applied. Tubers will also want to be sure to have warm gloves and a hat or beanie. Remember, the majority of body heat is lost through the head. A simple beanie can do wonders to keep tubers warm, especially during a storm or periods of snowmaking. Should any of these important items be forgotten, the Mountain High Sport Shops, located at all three Mountain High resorts carry the latest in clothing and equipment for winter enthusiasts. For more information on the North Pole Tubing park visit http://www.mthigh.com/mountain/north-pole-tubing-park . Or contact John McColly, CMO, at john@mthigh.com or 760 316 7803.